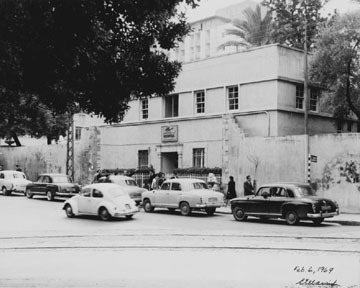 This photograph of five Mercedes-Benz Ponton taxis hangs on the wall of the American University in Beirut, Lebanon. It was taken on February 6, 1969 by a photographer from the Nassif family. In order to obtain a copy of this photo, I had to get the approval of the AUB president. Since I am an alumni, he gave me an appointment during which I explained why I was interested in the photo. The president of the university also looked at the Mercedes-Benz Ponton website! The environment in the photo has changed since 1969. In place of this old building there is a huge underground garage for the new American University Hospital (AUH). If you have a look at the road, you will notice two parallel lines. This was a railway that used to pass by the AUB on Daniel Bliss Street. The train traveled on this and other main streets of Beirut. It was replaced in 1970 1 by a new bus service which only existed until 1975 because of the civil war. In the photo, you can see five Type 180b Ponton taxis. The third one to the left has a Webasto sunroof, but it is not visible after scanning the image. On the right, next to the first black Ponton, you see a sign painted black and white. These signs were used to show designated areas where taxis could stop. Anyway, I hope you enjoy the photo. This place is called al Bourj Square (the square of the tower) or the Martyr's Square. It is exactly in the center of Beirut and divides the city into Moslem and Christian sections. That is why it became a "no man's land" and was completely destroyed during the (1975-1990) civil war. 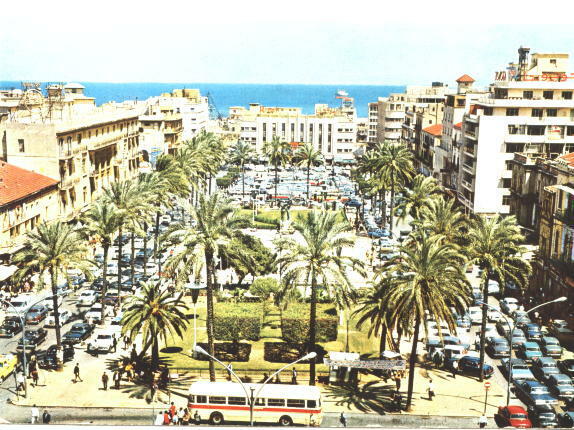 Before the war, the Martyr's Square was the most crowded area in Beirut. All of the offices, restaurants and movie theaters were there. Also, there was the central parking where all taxis (Pontons) used to gather and go to all the regions of Lebanon. Now, the Martyr's Square is a huge empty piece of land. Only one building remains and it became the Virgin Megastore. The white and red bus in this photograph is presumed to be a Mercedes-Benz since it is known that the government used to buy Mercedes-Benz and Renault vehicles. The bus system only lasted from 1970 until 1975.1 There are many Pontons in this photo. 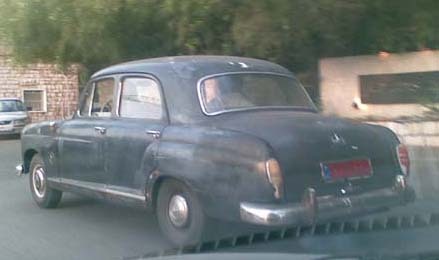 This is a working Mercedes-Benz Ponton taxi in a small coastal city north of Beirut. The red license plates are typical for taxis. The photo was taken in June 2008, nearly fifty years after the production of the Ponton series ceased. 1. July 23, 2004: Ramzi received the following correspondence from Kheireddine El-Ahdab who was a visitor to this page, "I am a 38 year old Beiruti who has lived in Montreal since 1991. I enjoyed your website about the Mercedes-Benz Ponton taxis; however I would like to point out that the tramway in Beirut was discontinued in 1964 and not in 1970. The yellow and red buses that replaced the tramway cars were French made Saviem-Chausson. They were used until they became street barricades in 1975-1976. 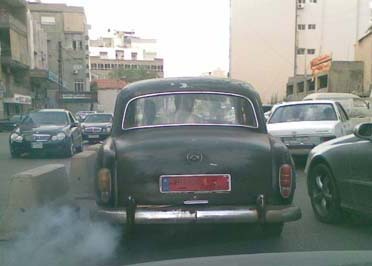 As you know, the Mercedes-Benz Ponton was a trademark of Beirut, up to the point that I always had the impression that it was Lebanese made! I also remember the "Fintail" Type 190Dc - 200D models made from 1959-1968. Very often, those taxis were equipped with a reinforced front bumper and a chrome ramp on the front bench seat (I used to hit my mouth on those ramps). Often they would also have photos of Beirut and/or the Virgin Mary or a Coranic verse mounted on the front dash."